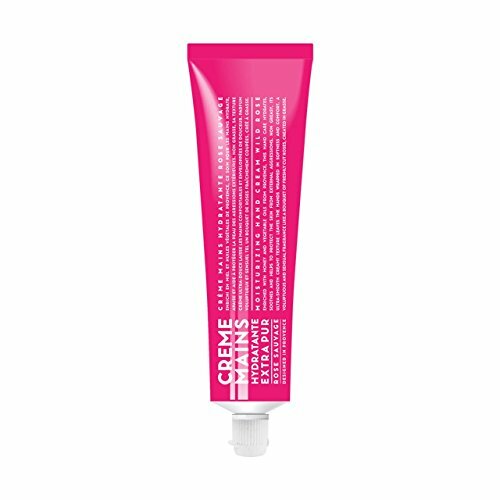 Because your hands deserve special attention and daily care, La Chatelaine designed this luxurious hand cream from the South of France, blended with 20% Organic Shea Butter, Vitamin E and Argan Oil to deeply moisturize, nourish and repair even the driest skin. Organic Argan Oil is high in vitamin E and essential fatty acids to keep hands soft, smooth, and rejuvenated. La Chatelaine's hand cream is enriched with Vitamin E, an antioxidant that protects and repairs skin by neutralizing the effect of free radicals. Hand regains its youthful appearance and skin is beautiful again. 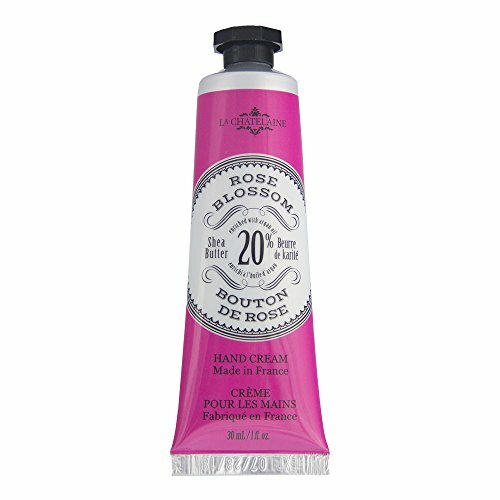 This elegant yet affordable hand cream is for every day use and can be applied as desired. Thanks to its rich yet light creamy texture, the hands are instantly moisturized and feel healthy again. La Chatelaine designed this refined and exclusive hand cream inspired by the warm colors of Provence. Delight a loved one or simply pamper yourself with this unique and effective hand solution. Offered in the perfect size for gifts, travel or simply your purse. Tastefully infused with a light invigorating scent that will leave hand refreshed and delicately fragranced. 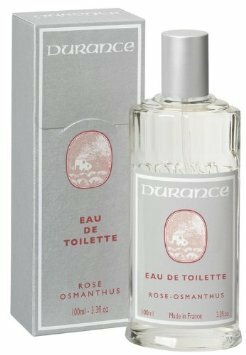 Inspired from old recipes by French Provence herborists, Durance has taken lovely scents and combined them in new and attractive ways. By the makers of our favorite Epi de Provence soaps and body care products, this new line called Amour de France, uses organic argan oil and shea butter to create a lush, sensuous experience that will leave your skin fragrant, so soft and smooth. Made in France, 300 ml or 10 fl oz. Amazing scents and superb quality - a little of this goes a long way, so splurge, you deserve it! Because your hands deserve special attention and daily care, La Chatelaine designed this popular trio of luxurious hand creams from the South of France, blended with 20% Organic Shea Butter, Vitamin E and Argan Oil to deeply moisturize, nourish and repair even the driest skin. Organic Argan Oil is high in vitamin E and essential fatty acids to keep hands soft, smooth, and rejuvenated. La Chatelaine's hand creams are enriched with Vitamin E, an antioxidant that protects and repairs skin by neutralizing the effect of free radicals. Hand regains its youthful appearance and skin is beautiful again. 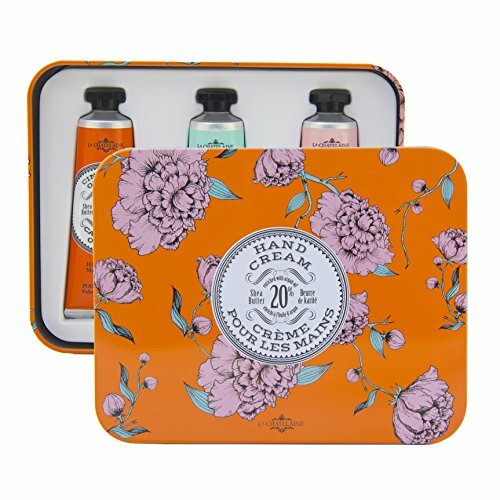 This stylish tin set offers hand creams that are for every day use and can be applied as desired. Thanks to a rich yet light creamy texture, the hands are instantly moisturized and feel healthy again. La Chatelaine designed this refined and exclusive hand creams inspired by the warm colors of Provence. Tastefully infused with a light invigorating scent that will leave hand refreshed and delicately fragranced. Give as the ultimate hostess or teacher's gift or simply pamper yourself with those unique and effective hand solutions. Presented in a reusable tin for life's little treasures. Enriched with honey and vegetables oils from Provence, this ultra-smooth cream hydrates, soothes and helps to protect the skin from external aggressions to leave the hands wrapped in softness and comfort. 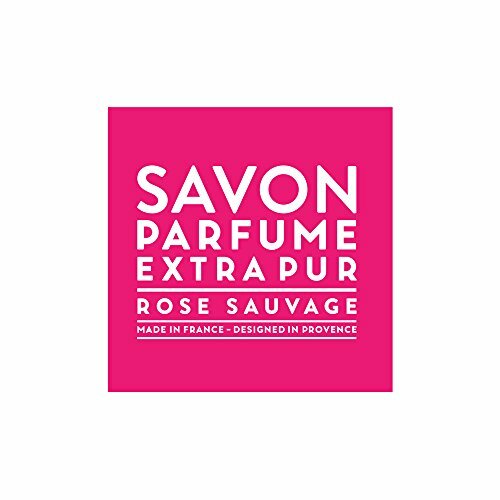 Fragrance: A voluptuous and sensual fragrance like a bouquet of freshly cut roses, created in Grasse. Use Advice: Apply several times a day on hands that have been washed and dried thoroughly. Composition: Trio of vegetable oils : Sweet Almond Oil, Olive Oil, and Grape Seed Oil. These natural ingredients of which virtues and efficacy are recognized in the universe of cosmetics and elsewhere, bring by their origin a real difference to our formulas. Free of colouring agents and animal fats. 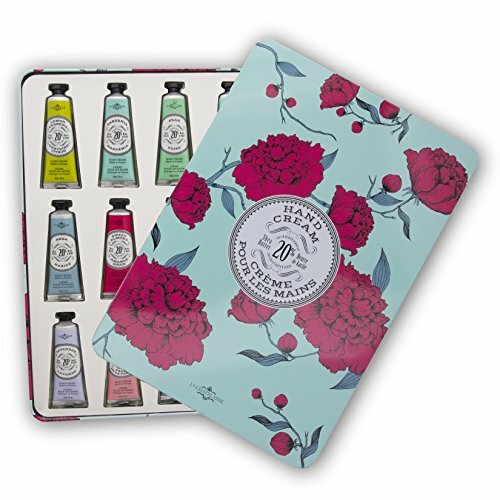 This stylish and popular hand cream gift set is designed to pamper! Because hands deserve special attention and daily care, La Chatelaine designed this luxurious hand cream gift set composed of 12 -1oz tubes from the South of France, blended with 20% Organic Shea Butter, Vitamin E and Argan Oil to deeply moisturize, nourish and repair even the driest skin. Organic Argan Oil is high in vitamin E and essential fatty acids to keep hands soft, smooth, and rejuvenated. La Chatelaine's hand creams are enriched with Vitamin E, an antioxidant that protects and repairs skin by neutralizing the effect of free radicals. Hand regains its youthful appearance and skin is beautiful again. This luxurious gift set offers hand creams that are for every day use and can be applied as desired. Thanks to a rich yet light creamy texture, the hands are instantly moisturized and feel healthy again. La Chatelaine designed this refined and exclusive hand creams inspired by the warm colors of Provence. Tastefully infused with a light invigorating scent that will leave hand refreshed and delicately fragranced. No need to gift wrap, packaged in a chic embossed reusable tin, ideal gift for yourself or your most cherished friends and family. 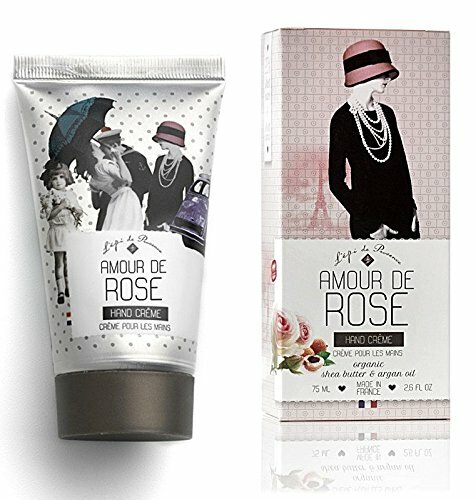 By the makers of our favorite Epi de Provence soaps and body care products, this new line called Amour de France, uses organic argan oil and shea butter to create a lush, sensuous experience that will leave your skin fragrant, so soft and smooth.Made in France, 75 ml or about 2.5 oz.. Amazing scents and superb quality - a little of this goes a long way, so splurge, you deserve it! 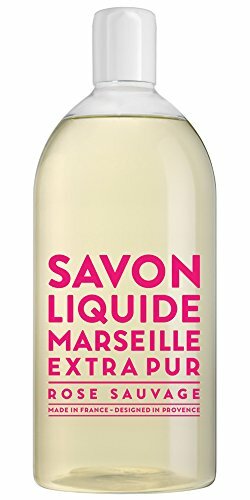 Enriched with traditional Marseille soap and vegetable oils from Provence, this scented soap gently cleanses and perfumes the skin. Fragrance: A voluptuous and sensual fragrance like a bouquet of freshly cut roses, created in Grasse. Use Advice: Apply water on soap and gently rub it between hands to obtain a generous lather. Can be used every day to clean the body under the shower or in a bath, and to wash hands. Rinse thoroughly. Moisturize skin after shower. Composition: Trio of vegetable oils : Sweet Almond Oil, Olive Oil, and Grape Seed Oil. These natural ingredients of which virtues and efficacy are recognized in the universe of cosmetics and elsewhere, bring by their origin a real difference to our formulas. Free of colouring agents and animal fats. Copyright © Wholesalion.com 2019 - The Best Prices On Occitane Rose Online.